With improvements in healthcare, diet and exercise habits, Americans are generally living longer lives and enjoying more active and vibrant retirements. Early retirement has also become more common, resulting in many retirees faced with the challenge of not outliving their retirement assets. The assets used to create a vital stream of income during retirement face risk from economic turmoil, interest rate uncertainty and market volatility. At retirement, it is critical that your accumulated assets are correctly positioned in a series of investments that are designed to provide you income throughout the remainder of your lifetime. 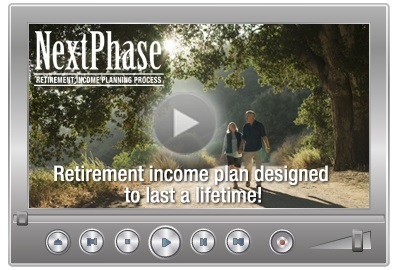 The process that we use is called the NextPhase™ Retirement Income Planning Process; it is a time-segmented, inflation-adjusted strategy that is designed to help you find a balance of investment choices with different, complementary risk and growth opportunities. 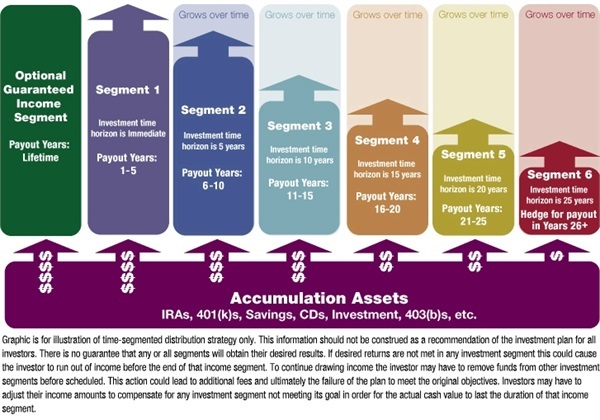 The graphic below illustrates how your accumulated retirement assets are divided into different time-segments. The optional guaranteed income segment and the first pool are designed to offer immediate, regular income streams, while the other pools of investments are designed to grow over time. As time goes on, each pool is drained to fill the reservoir that provides your regular income stream. The strategy typically plans for 25 years, at which point the last pool can be divided up again to provide for a longer retirement or used for legacy planning. If you are within ten years of retiring or have retired within the last five years, talk to us today about creating your customized NextPhase Retirement Income plan.